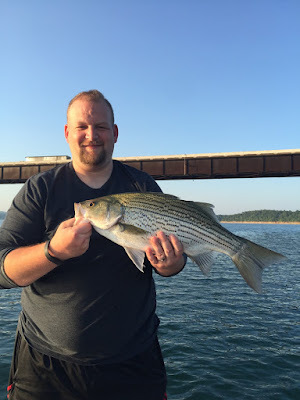 Norfork Lake striped bass fishing is continuing to be a strong bite. Fish are still scattered throughout the lake and are mainly concentrated in 25 - 40 feet of water either on the bottom or suspended in deep water. 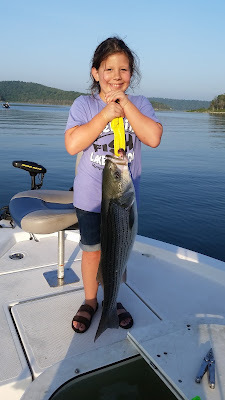 For the last couple of weeks, I have been fishing with my daughter and her family and we had a blast. 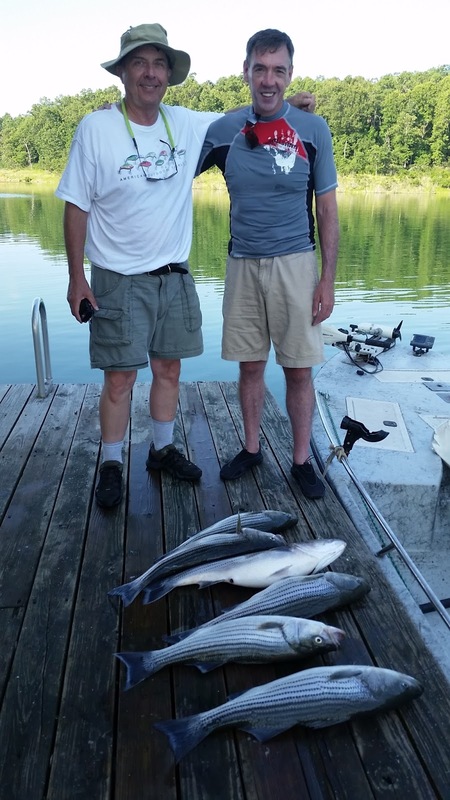 All were catching fish including the little ones. After keeping several limits of stripers the first couple of days, we started releasing all fish that we caught. My 4 year old granddaughter had fun catching blue gills at the dock and she is getting really good with her Tinkerbell pole. 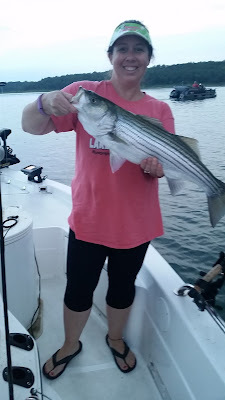 Live thread fin shad has been working great for my group, but vertical jigging with a spoon and trolling with swim baits is also producing some nice fish. 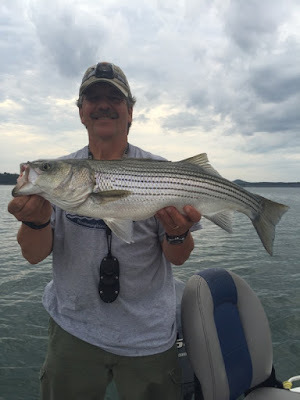 Largemouth bass fishing has slowed a little but is still good. There is some topwater action early in the mornings, but the bigger ones are going deeper. I have found bass part way back in creeks at channel swings near points. They are in shallow water early then move out to 20 - 30 feet of water as the sun gets high in the sky. There are plenty of bass hanging out in the shadows of the docks during the day. 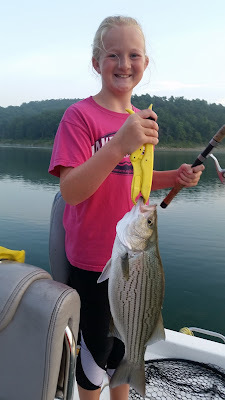 Crappie fishing is also in its hot water mode, hard to find, but once you locate them you will catch some nice fish in the 10 - 14 inch range. A couple of our guests have been crappie fishing and did well both yesterday and today. Start looking for brush piles back in creeks and coves. 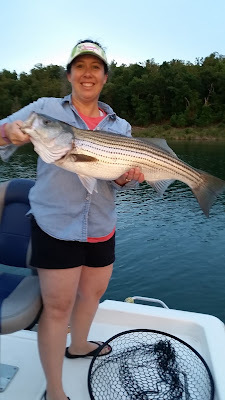 The brush should be in 20 - 35 feet of water and the fish will be suspended on the tops of the brush, but some of the nicer ones will be deeper. There are still plenty of nice crappie in the shadows of the docks during the day. There are some nice walleye being caught. Look for walleye in 25 - 35 feet of water. They will be around main lake points that have brush nearby or at this same depth along the rocky bluff walls. Jigging spoons as well as a crawler harness are working. Norfork Lake level is falling slowly and currently sits at 555.93. The Corps is running one generator continuously. The lake surface water temperature is in the mid to upper 80's. The main lake is clearing and the creeks and coves are slightly stained.